Size matters when it comes to the length of USB cables. We have all been in that situation where our convenience and comfort is infringed by the shortness of a USB cable. For instance, you are at a coffee shop and you would like to charge your iPhone but the only free table is just out of reach from the power outlet, next to the knee of a person who isn’t using the outlet but looks extremely content with her coffee and array of books. What do you do? Do you disturb the person and ask her to switch tables with you just so you can hook up to the wall? Or do you shoot her grumpy looks in the hopes that she will feel unwelcome and free up the coveted spot near the power outlet? Thanks to the new 2-meter lightning USB cable from Apple, you do not have to disturb this person, nor do you have to go through the inconvenience of having a shorter cable. The Lightning to USB cable from Apple is the 8-pin connector for new Apple devices such as the iPhone5 and the iPad mini, superseding the larger 30-pin dock connector that accompanied the earlier models of iPhones, iPads and iPods. The regular cable that comes with these new Apple devices are usually just 1-meter long, which may not even be sufficient if you have your system unit under your table but want to plug in your device and keep it on your desk. The 2-meter lightening USB cable can be easily purchased separately and allows you to be freer with the location of your devices. Not to worry about compromising the speed of your data going from Apple device and your computer and back. The 2-meter lightning USB cable is just as fast as the 1-meter cable, thereby proving that longer is better. 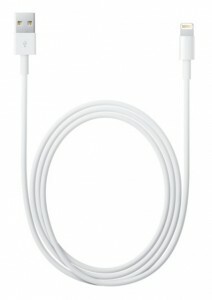 The 2-meter lightning to USB cable from Apple is already available on the market from official Apple retailers for $29. If you would like to order it directly from the Apple website, it only takes 24 hours or less to get to you. If want to avoid being that person who disturbs other people in public spaces in order to get close to a power outlet and enjoy the convenience of a longer connector cable for your Apple devices, then this is a wise choice. This entry was posted in Apple and tagged Apple, Lightning, usb cable. Bookmark the permalink.